Debenhams is struggling but Asos appears to be bouncing back. After mixed news from the supermarkets, Next, M&S and AO World, today another two retailers gave us a glimpse of how well they handled the crucial Christmas period. 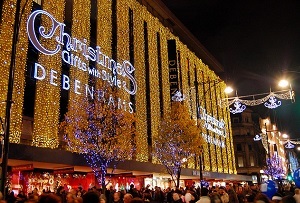 Debenhams had a very upbeat trading statement, highlighting a 4.9% jump in like-for-like (LFL) sales in the four weeks to January 10th, a 28.9% jump in online sales in the same period, and a 121% online boost on Black Friday. 'I am pleased with our performance in the critical Christmas trading weeks, driven by our strength in a diverse range of product categories and a strong marketing campaign focussed on gifting,' said the department store chain's chief executive Michael Sharp. Unfortunately for him, the bigger picture isn't looking so great. In the 19 weeks to January 10th, group LFL sales were down 0.8%. Debenhams blamed this on 'the well-documented challenges in the clothing market' and a move away from offering excessive amounts of promotions. Fair enough you might think, but the result of this that gross margins aren't holding up too well. The statement conceded that because people were buying more low-margin items like cosmetics, its gross margins would be towards the lower end of the 10 to 40 basis point guidance given in October. This perhaps explains why investors weren't too happy – Debenhams shares were down 7.7% this morning to 69.24p. And reassured they were. Shares were up 6.2% to 2,577p this morning, still way down from its 2014 peak of 7,039p, but a good start to 2015 nonetheless.